The Nokia 9 is expected to launch in early 2019, and at this time, there's no word on expected pricing. 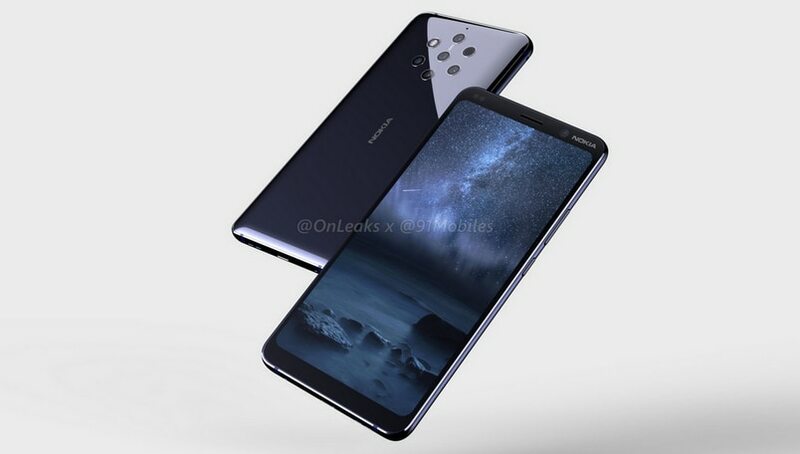 The renders show Zeiss branding between the cameras, and while there isn't mention of PureView on the body, it's nearly a given that HMD Global will revive the iconic PureView branding with the Nokia 9. We don't have any specifics as to what those five cameras will entail, but we'll likely see the usual assortment of a main sensor, wide-angle lens, a telephoto one, and more. While most flagships come with the regular top-end specifications, Nokia seems to be upping the ante when it comes to photography as the obvious highlight of the Nokia 9 is the Penta-camera setup on the rear. It's unclear what exactly any of the five cameras are for, but some other rumored specs for the device are discussed, such as a possible 5.9-inch QHD display and a fingerprint reader under the screen. (It does not have a display notch.) The phone has fairly small bezels on all four sides, and its dimensions are expected to be 155 x 75 x 7.9 mm. Two cameras on the back of your phone not enough? However, until that happens, you can take a look at the recent renders and a 360-degree video of the yet-to-be-launched smartphone and marvel at its design. Like the OnePlus 6T, there will be an in-display fingerprint sensor and glass back panel - which could hint to wireless charging. Alongside there's no 3.5mm headphone jack as well, which means this would be another flagship Android phone to ditch the standard 3.5mm jack. The power button and volume rocker are seen on the right, while the bottom shows a USB Type-C port and a single speaker grille. A secondary microphone is cleverly integrated into the antenna band on the top edge, while a third (presumably noise-cancelling) microphone is located at the rear. The conventional Zeiss branding can also be seen in the leaked renders. It will run on a Snapdragon 845 processor - rather than the forthcoming 855 chipset - and include up to 8GB of RAM.